Lord Corwnallis withdraw...to the west??? Savannah is mine, to the south, why does my army should retreat to the west, to that savage province? There is not any reason to retreat to the worst province of all. Any explanation? It makes no sense at all. Why does my army should withdraw to the west? Should not my army have retreated south, for example? There are better provinces around, with roads and better supplies. This is not the first time that my armies win...but retreat to the West? Why to the west? I have the turn files. I can send them tonight if you want to check them out. PD: This retreat is important because that army will lose in the next turns 75% of his men (6 elements of infantry + 1 of cavalry) and my artillery unit will be destroyed for lack of supplies. I have won clearly in Augusta but I have lost an army because of this retreat. The two regions to the west are the only regions Controlled by GBR. That gives priority in retreat. Look in \WIA\Settings\GameLogic.opt to see the Retreat Factors used by the game to choose a retreat path. lodilefty wrote: The two regions to the west are the only regions Controlled by GBR. That gives priority in retreat. Wouldn't be better that the priority was the direction of the closest big city controlled by the nation or the best supplied province regardless of who controls that region? The USA have no more troops around Augusta and a big army should be able to retreat to one of that provinces without problems. 408 casualties in the first side, 2583 in the other, only 6 Militia bataillons left, i suposse with very low cohesion. So english Victory, but the english retreat!!! why? because of low cohesion? lower than the losers of the battle? this kind of retreats are very frustating. american side : 10 elements lost british none and british retreat ??? Another one, similar case. 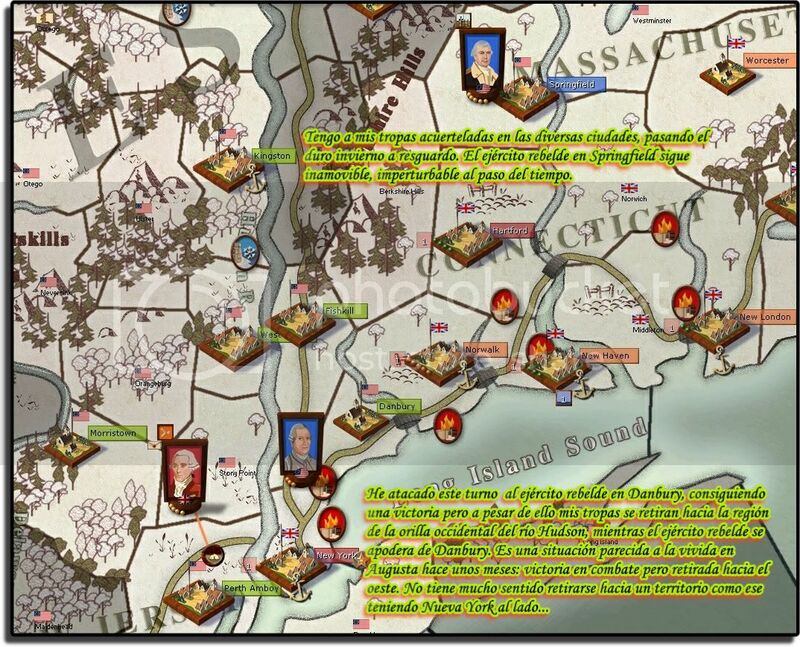 My army has withdrawn to an enemy province when New York is mine. Retreat, again. And again to the west when in this case New York is controlled by me. Seems that the controlled province priority for retreats in this case has failed completely because the province where I retreat is not under my control (Stony Point). I moved my army from New York to the north to attack the rebel army, by the way. Your Cornwallis approaches from the very region he retreats back to. GBR intercepts, and defeats USA at Danbury. 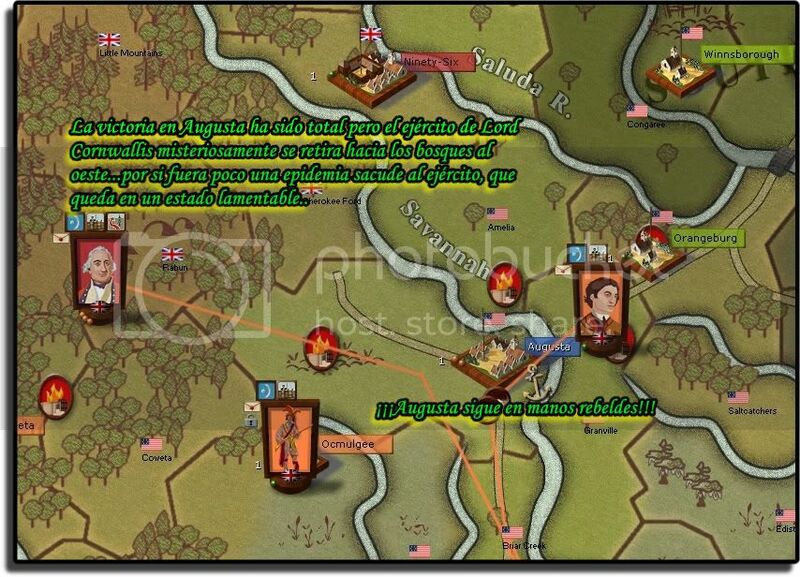 USA retreats across the river and GBR pursues across the river and defeats USA a second time. USA retreats back to Danbury. WAD, as the USA has several probabilities for retreat targets. The GBR pursued and won twice!!! You can watch this in the Replay, as it clearly shows the movements. This clearly shows why a screenshot os essentially useless to diagnose what goes on. Retreats and routs are probabilities, not certainties. lodilefty wrote: Your Cornwallis approaches from the very region he retreats back to. Thank you very much lodilefty, clear now. Do you know why Cornwallis retreats althought he wins the battle clearly? Low cohesion or lack of moral because of the battle at the end of it?